How I Sour Mash…& A Recipe! I get the occasional request to explain how I sour-mash/sour-wort. So you ask, so you shall (eventually) receive! Along with a description of my method – which is not all that unusual compared to methods others have published – I’m going to add in a few microbiology insights, some information on determining when you want to stop the souring process, and some other random hints & tips. If you missed it, I also put up a post a few weeks ago about preparing lacto starters – a key thing you will need to do for a good sour mash/wort. Around the same time, 5-blades brewing put out a good post on harvesting wild lacto safely – a method I’ve used myself. Eureka Brewing also put up a post on optimized “media” for lactobacillus culture. I haven’t tried Sam’s media recipe, but its sound from a microbiology point-of-view. For a complete picture of the sour-mash/worting method I’d recommend reading this post alongside these other posts. I’ve prepared this post alongside a brew-day, so I’ve include my standard Berliner Weiss recipe at the end. I love this recipe – simple and straight-forward, is great straight-up, but also works as a perfect base for fruited (lemon & cherry are excellent), s (coriander & salt = pseudo-gose), or bretted for a funk & fruit finish. I am doing a split batch this time around, to make the most of the recipe. Details, as always, can be found below the fold. Sour Mashing or Worting – What Is It? Sour mashing and sour worting are two methods or producing rapid sour beers. While the final beer doesn’t have the same complexity as a beer soured using the traditional multi-year fermentation, this method does produce a sour beer in weeks-to-months. It is commonly used to make Berliner Weiss, and more recently has been used by homebrewers as a way to produce Gose and other sour styles. Some commercial operations are beginning to use this method as well, with good success. Sour-Mashing: The concept is simple – you mash, but rather than lautering you allow the mash to cool to 35-43C (95-110F) and then pitch some souring bacteria (almost always Lactobacillus) to sour the mash/wort. Once sufficiently soured (usually 3-4 days later), the the lauter is conducted, the wort treated as desired (boiled, hopped, spiced, etc) and the beer fermented with the desired yeast. Vola – a quick sour beer! Sour-Worting: The idea here is nearly identical to sour-mashing, except you mash & lauter, and then sour the resulting wort. Which is better? In my opinion, sour-worting is better than sour-mashing for three reasons: 1) more control, 2) lesser chance of infection-related off-flavours, and 3) less risk of astringency from prolonged soaking of the grain. In this post I will only cover sour-worting in detail. My (now former) sour-mashing method has been posted previously. That said, the method I currently use to maintain temperatures can be applied to both a sour-mash and sour-wort. In the days before brew-day you will need to prepare a starter of lactobacillus, and ideally, a starter of your yeast. Additional details of preparing a starter can be found in the opening paragraphs of this post; Lactobacillus sources are descried in the next section, below. Mash & sparge as per usual. Bring to a brief boil (critical if using an immersion chiller to cool to pitching temperatures, to sanitize the chiller); I boil for ~1 min, then let it sit 10 minutes before I start cooling. There are many available sources of Lactobacillus. Most yeast suppliers – White Lab, Wyeast, Omega, and others – provide pure strains of brewery-friendly Lactobacillus. By “brewery friendly” I mean that they are not overly hop tolerant and thus are unlikely to contaminate future brews. If you use my sour-worting method, the risk of contaminating your downstream equipment is minimal, so this isn’t really a selling point. Adjust the wort pH to 4.5 with lactic or phosphoric acid prior to boiling the wort. Boil, cool & then pitch the grains. Other wild source include a huge array of sources – lactobacilli are found all over (and inside) our bodies, on most fruits, in sourdough bread starters, lactic fermented pickles, etc. Using methods described in my previous posts you could purify lactobacilli from nearly anywhere and use it for souring your beer! Another option is “alternate commercial sources” – i.e. foods fermented with Lactobacillus, from which you can harvest the organism. Lactobacillus can also be grown from probiotic capsules and some types of yoghurt. When selecting these types of starting materials, try to find sources with only Lactobacilli in it (although Bifidobacteria-containing materials are fine as the bifido will die in the starter & is a lactic-acid bacteria anyways). Some of these lactobacilli are very aggressive and can sour your beer in as little as 24 hours! A link with good (although US-centric) alternative sources for Lactobacilli can be found over at the Milk the Funk Wiki.Some people have reported that the “complexity” of the sourness is not as good with a single pure strain as it is with a mixed strain (like that you’d get from a handful of grain). I’ve noticed the same thing with my sour-mash beers, and as such always pitch a blend. In the recipe below I’ve pitched a mix of Wyeast and White Labs L. brevis, plus Wyeast’s L. buchnerii. A starter prepared from grains will likely be a mix of lacto’s, so you don’t need to blend if using that as a source. When starting out with sour mashing/worting the hardest part to master is getting the desired acidity. It is easy to both over and undershoot the degree of acidity you achieve. There are two ways to determine when you have the correct acidity – by taste, or by pH. While the later is arguably more accurate and consistent, it its not optimal as it does not account for flavour balance. I shoot for a combination of the two; using the pH to determine if I’m in-range, and taste to determine if the balance is right. By Taste: Taste is your best tool for determining when the beer is done souring, but until you’ve done this a few times it can be hard to “calibrate” your tongue. The sweetness of the unfermented wort masks the degree of acidity present, meaning the final beer will taste much more sour than a taste of the soured (but not yet fermented) wort indicates. The change in apparent sourness will depend on the starting and ending gravity for the beer, making this even more complex. A larger the gravity change during fermentation equals a larger change in apparent acidity. Despite the complexity of determining when to stop the souring process, the ability to taste the balance of acid and malt components (while trying to ignore the sweetness) gives you a better indication of what the final flavour balance will be – and thus gives you more control over the beer. But that requires some practice. By pH: The other option is to go by pH; this allows you to target a desired acidity fairly accurately, although the perceived acidity can vary somewhat from what the raw pH indicates. As a “rule”, a pH of 3.8 will have a very subtle acidity, 3.6 will have a noticeable but mild acidity, 3.4 is your average (i.e. fairly sour) Berliner Weiss, and below that gets you into enamel-stripping country. Again, backing this up with a taste test will help you “dial-in” the acidity’s balance better than a straight pH reading. The downside to pH is the requirement for a pH meter…or is it? 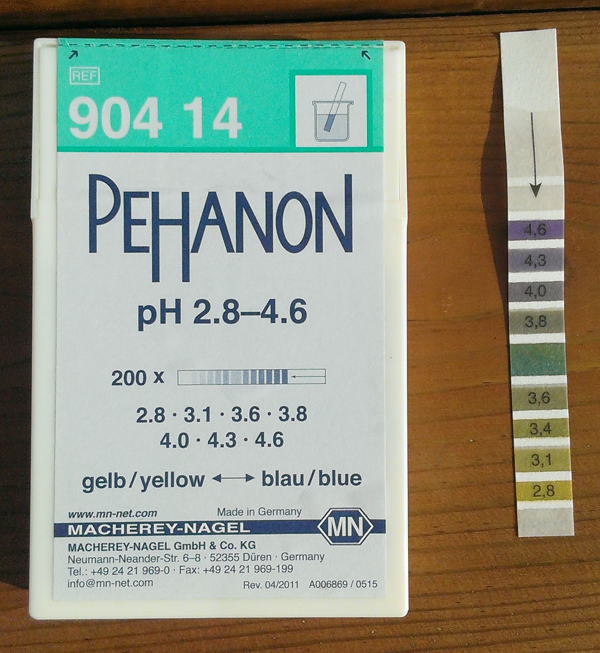 The pH strips in the above picture work very well, are targeted at the pH range we’re interested in (4.6 to 2.8), and are fairly cheap ($20 for 200 strips). Although not as accurate as a quality pH meter, they are equal-to or better-than a cheap meter and cost far less. Infections – You Must Be Joking! A lot of brewers starting off with sour mashing/worting are often surprised that infections remain an issue. They think that its already “infected”, and then are surprised when they get off-flavours associated with “other” infections. Despite the fact we are souring with a bacteria, it is critical we reduce or eliminate the contributions of other bacteria, as they can produce nasty off-flavours and aromas we do not want in our beer. Luckily, preventing these infections is rather trivial. So what causes these issues, and how to we prevent these problems? Enteric Bacteria: Enteric bacteria are fairly dangerous (they include multiple food-poisoning bacteria such as E. coli). In addition, they can create a number of bioactive amines; compounds which smell (and presumably taste) of faeces and vomit. As in they make stuff you definitely do not want in your beer! All of these organisms are capable of anaerobic metabolism, meaning that the common practice of using a CO2 blanket or saran wrap to cover the souring beer is not sufficient to prevent their activity. Clostridium: There are a number of Clostridium species that will grow in sour mashes/worts if given an opportunity, and they all produce copious amounts of butyric acid – a rancid, putrid, generally unpleasant (often described as “baby vomit with parmesan cheese”) compound we don’t want much of in our beer*. These species include C. butyricum, C. kluyveri, C. pasteurianum and others. All of these organisms are obligate anaerobes, meaning that the common practice of using a CO2 blanket or saran wrap to cover the souring beer will act to enhance, rather than inhibit, their activity. * If fermenting with Brettanomyces a small amount of butyric acid can be beneficial – the brett will combine it with ethanol to form ethyl butyrate, which tastes of pineapple and tropical fruit. But only small amounts of butyric acid are needed for this – you cannot save a butyrate bomb with a pitch of brett. Acetobacter: This is the bacteria that makes vinegar. A novice sour-beer maker may think this is a good thing – its still an acid (acetic acid, specifically), but unlike the lactic acid made by Lactobacillus the acetic acid is very harsh and unpleasant*. Unlike the last two groups of bacteria, Acetobacter is an aerobe, meaning it needs oxygen and thus will be inhibited by the use of saran or a CO2 blanket. * As with butyric acid, if using brett a small amount of acetic acid can be beneficial. Brett will react it with ethanol to form ethyl acetate; in small amounts this is fruity, but becomes solvent-like in larger quantities. Sanitize the wort by heating to 83C/180F for 10 min, or by bringing the wort to a short boil prior to adding the Lactobacillus. This alone is usually sufficient – so long as your lacto pitch is clean and you are doing this in a clean space an oxygen barrier is not required. For sour-mashes I strongly encourage adding a mash-out step – this will raise the temperature sufficiently to kill most contaminants. Do not boil a mash! Pre-adjust your wort to a pH to 4.5 with lactic or phosphoric acid; this will inhibit the enteric bacteria and some Clostridium activity. 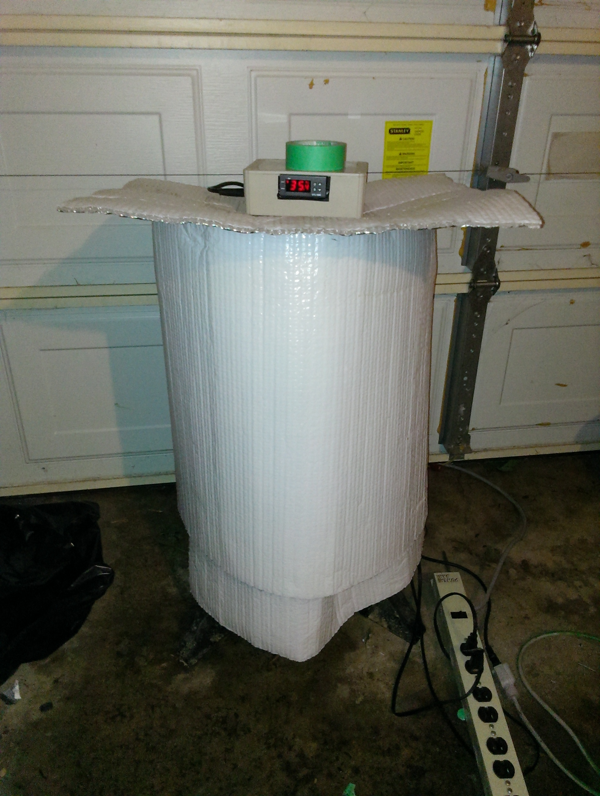 Cover the mash/wort with a CO2 blanket and/or saran wrap. This will impeed oxygen entry, thus limiting Acetobacter activity. Technically this is unnecessary (as described above), but it is a cheap piece of insurance. Assuming this saves a mere 1 batch in 100, you’re still saving quite a bit of money compared to the ingredient cost of one lost batch. Keep your souring wort/mash above 39.5C (103F); this will inhibit most of these off-flavour producing species without harming the Lactobacillus being used for souring. For commercial brewing strains, hold at 35C/95F, as these strains do not handle the higher temperatures well. One of the more difficult things to achieve while sour-worting or sour-mashing is maintaining the high souring temperature over several days. Remember, we are looking to maintain temperatures just below body temperature (for commercial brewing lactos’ 35C/95F), or just above body temperature (for wild/alternative lacto’s, 39C-42C). So ambient temperature – even if you live in the hottest place on earth – is unlikely to be sufficient! Luckily, lots of methods have been developed by homebrewers, requiring differing levels of equipment, to achieve this end. Boiling water method: This is by far the easiest method – if you use an insulated mash tun for brewing. Simply prepare your mash as thick as possible (if sour-mashing) or your wort at double the final concentration (if sour-worting). The mash is kept in the insulated mash tun, while the wort will need to be sanitized in the kettle and then transferred back into a cleaned and sanitize mash tun. Once the wort or mash is in the tun and at the right temperature, pitch the lacto and then wrap the tun in additional layers of blankets. 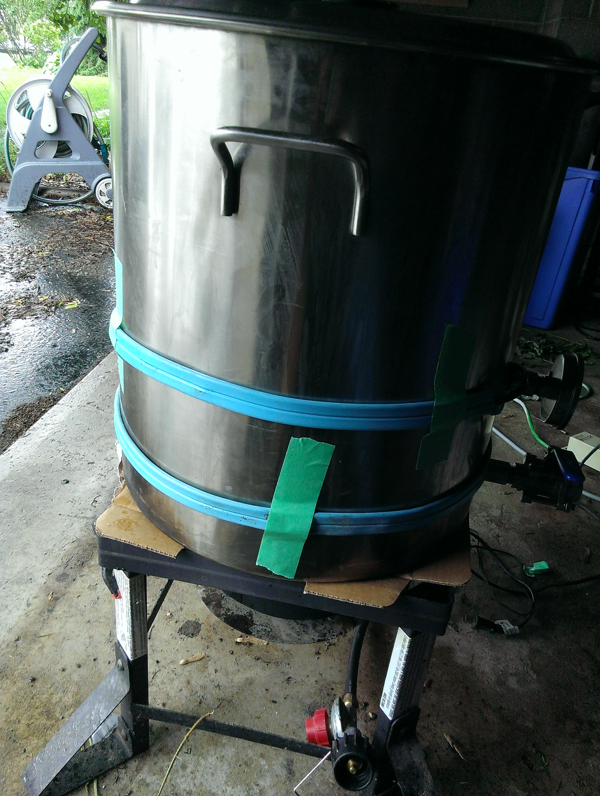 To maintain temperature, open the mash tun every 12 hours or so, and add boiling water. Once soured, lauter (if sour-mashing) or dilute the wort to its final concentration (if sour-worting), and you’re good-to-go! Fermentation chamber: The opposite extreme is to use a dedicated, temperature-controlled, fermentation chamber to maintain temps. Most often these are some sort of insulated box or cabinet (sometimes a fridge is used), warmed with a heat source such as a light bulb, personal heater, or heat pad. A particularly brilliant example has been created by James of Basic Brewing, who uses an electric smoker as a ready-made chamber (video). This is the most advanced/equipment-intense method, but is also fairly easy and requires no work on your part (aside form monitoring the sourness) once your kettle is in the chamber. My method: In my opinion, my method gives the best combination of control, cost and laziness (lazy, in that it sours while sitting on top of the burner – no lugging around heavy pots during the souring process). It comes in about mid-ways in terms of equipment requirements. Step 1: Prepare your wort as described above, and cool it to the desired pitching temperature. 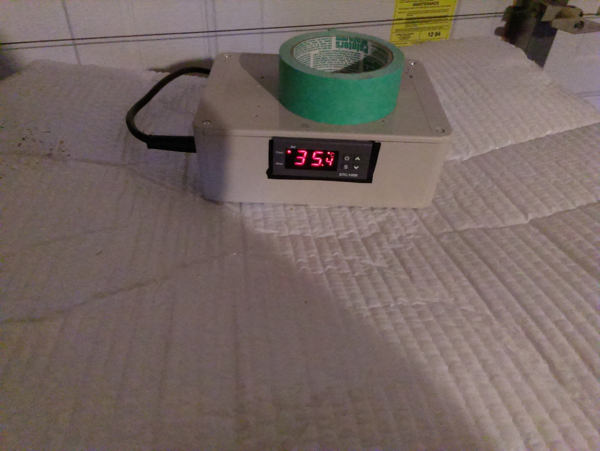 Wrap brew belts (alternatives include a heating pad or reptile terrarium heat cable) around the pot and plug them into your temperature controller. Optional: If you’re not removing the pot from the burner, slide a piece of cardboard under the pot to prevent drafts. Step 2: Attach temperature probe for your temperature controller. I attach mine (beneath vertical strip of green tape) about 10 cm (4″) below the top of the liquid, well above the heating strips. Step 3: Wrap a water-heater insulating blanket (or other fire-resistant insulation) around the pot, pulling it as close to the pot as possible. In my case I have to put this below the handles of my pot. Here, the insulation is on backwards – shiny side goes in! 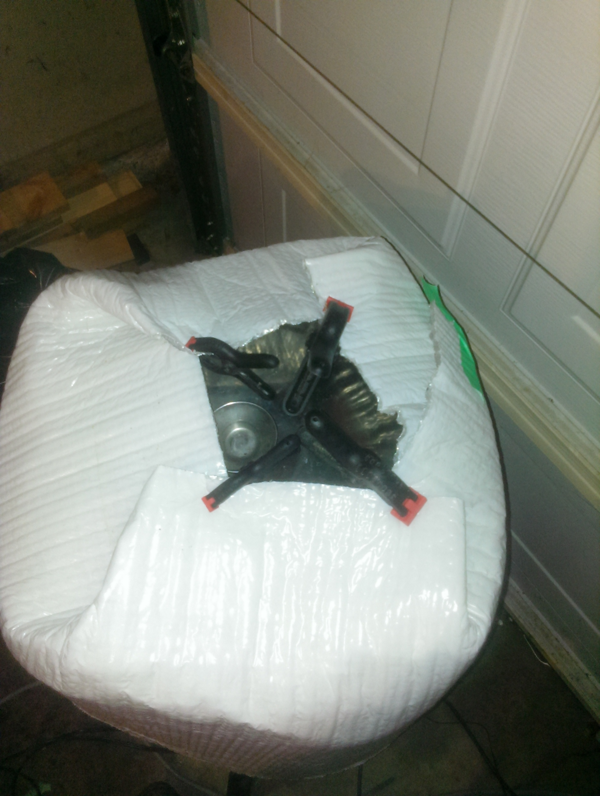 Note shown: my water-heater insulting blanket came in two pieces; I wrap the other piece around the top half of the pot, so the handles are covered. Step “3.5”: If your insulation is tall enough, or if you have 2 pieces, pull the top pieces over the lid to help lock in the warmth. Step 4: Place an insulating cover over the pot (more water heater insulation in my case), and activate your temperature controller. 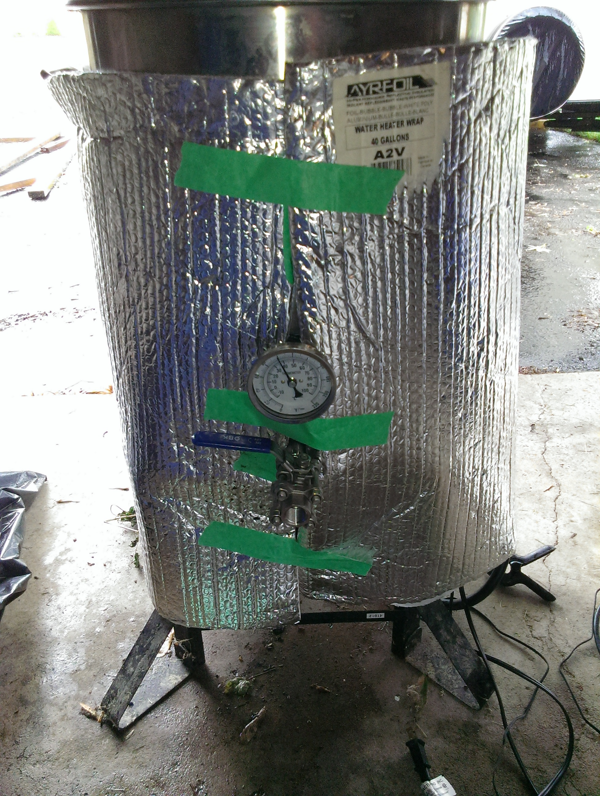 Let the system’s temperature equalize at the desired souring temperature. Step 5: Once the temperature has stabilized add the lacto starter and the saran wrap (+/- CO2) oxygen barrier. Test every 12 to 24 hours for pH and taste. 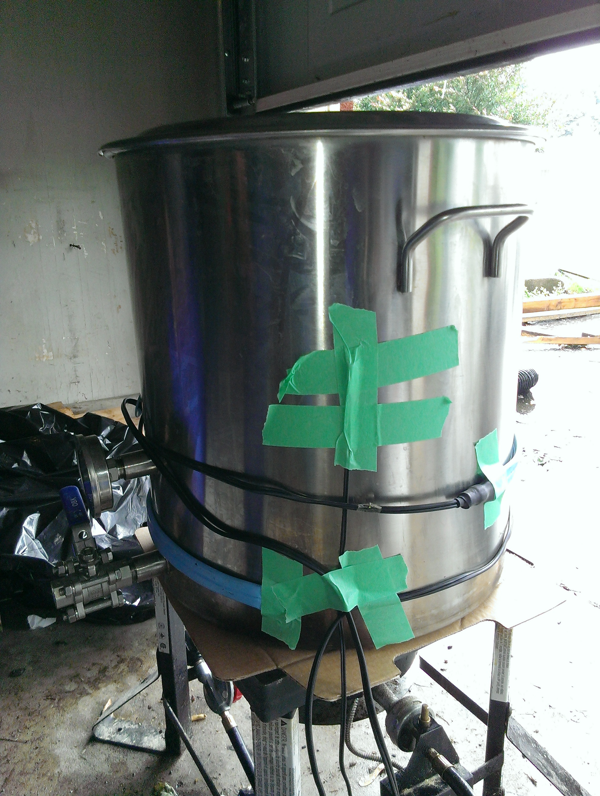 Step 6: Once sufficiently sour, remove all of the insulation, heaters, cardboard, saran, etc, and begin your final boil. Today’s boil looks normal, but don’t be surprised if you get a lot of scummy-looking material. That too is normal. To boil, or not to boil, that is the question. Or, at least, that is a debate among sour brewers. Boiling isn’t strictly necessary; pitching a healthy dose of yeast will finish the beer, with little additional acidity added by the lacto. That said, I boil for a few reasons. 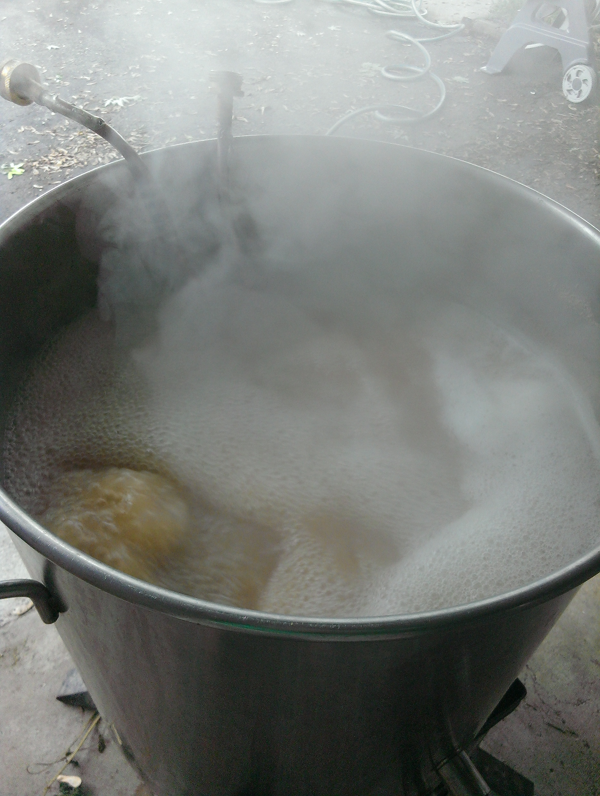 Boiling kills the lacto, ensuring my down-stream equipment remains clean. It allows you to add some hop or spice character – in my opinion, a Berliner Weisse without some noble hop character is not a Berliner Weisse (let the flame wars begin!). Plus it gives you some degree of protein coagulation which may or may not be beneficial. That said, this is a minimalist boil. You are looking for hop flavour/aroma, and the same from any spices, meaning the boil needs to be only 10 minutes long. If you’re not hopping, bringing the beer to a boil and immediately killing the heat will rid you of the living lacto and give you decent protein coagulation. Alternatively, if killing the lacto is important and you don’t want to boil, you can heat to 83C/180F and hold for 10 minutes. One concern some brewers have with these short boils is DMS, which is normally driven off by longer boils. DMS is, in theory, should be a real issue with these beers – lightly killined Pilsner malt is full of DMS precursors, and the short boil we subject the soured wort to is insufficient to drive tem off. Despite this, myself and many other brewers have never found DMS to be an issue. The reason for this is unclear – I suspect the DMS precursors are consumed by the lactobacilli, or alternatively, are driven off during souring – but no one really knows. I’ve even done no-boil sour worts (just heating to 83C/180F for 10 min prior to, and after completing, the souring process) without noticeable DMS. Fermenting these beers can be a bit of a challenge – even though they tend to be of low starting gravity (Berliner Weisse are typically 1.034 or less; Gose are usually 1.045 or less), as the high starting acidity can inhibit yeast activity. As such, an acid-tolerant neutral yeast such as the chico strains [Wyeast 1056, White Labs WLP 001, Safale US-05] or German Ale [Wyeast 1007] should be used. Pitch a healthy starter of yeast; I’d recommend using a lager pitching rate to ensure full attenuation. For the low-gravity beers, full fermentation can be complete in as little as 5 days, meaning a 1-week sour beer is possible (although 10-days is more typical for these “rapid” sours). Fermentation should be performed at temperatures normal for the yeasts, with the wort well oxygenated prior to pitching the yeast. Put it on fruit. Fruit Berliner Weisse (and presumably Gose – I’ve not tried this yet) are delicious. Transfer the fermented beer into a carboy containing a good dose of smashed fruit or fruit purée. The beer will re-ferment, after which it can be bottled or kegged. Dry hop it. Fruity hops (Citra, Galaxy, etc) are amazing, and complement the lemony notes commonly found in these beers. Add brett. Adding brett’s – especially those with fruity character – and then ageing for an additional 1 to 3 months radically changes these beers – and its a change for the better. The bretts will make a lot of esters – pineapple, apple and cherry being common examples, while some modest funk adds earthiness. The complexity and nuances of these beers is amazing, and well worth the slightly longer wait. Go for a full-on sour. After fermentation transfer to a carboy and add-in a sour mix – Wyeast Roeselare is a good place to start. Or throw in the dregs of your favourite unpasteurized commercial sour beer. Six to ten months later you’ll have a much more complex beer with many of the characteristics more typical of sour beers prepared in the traditional (and usually 18 months or longer) manner. So this post has gone on a lot longer than I planed, so thank you for reading this far! Today’s recipe is my base recipe for a Berliner Weisse – its simple, and can be easily modified for nearly any use. Today I am making roughly 32 litres (8.5 gallons) as I’m going to split this batch after the primary ferment – half will become a straight-up Berliner Weisse, the other half is being bretted with two strains of B. claussenii and the Wyeast (cherry-forward) strain of B. lambicus. So the first half of this batch will be a quick sour to enjoy this summer, the second half will be a fruit-and-funk treat for September. Lactobacillus (today I’m using a 1:1:1 mix of L. brevis from White labs, plus L. brevis and L. buchnerii from Wyeast). Yeast of your choice (I prefer Wyeast 1007, and am using that today. Often I use 1.5 packs of Safale US-05 [no starter, just rehydrated] out of laziness). Mash for a fermentable wort – I aim for 64C (148F) for 90 min, then lauter. Bring to a boil with the wort chiller in the pot. As soon as a boil is hit kill the heat, but don’t start the chill for 10 min in order to ensure sanitization of the immersion chiller & pot. Remove chiller, install heating system and insulate pot. Once stable souring temps are achieved (35C/95F for today’s brew), pitch lacto and cover surface with saran wrap. Once the desired acidity is achieved remove the heating equipment, put immersion chiller into the pot, and bring to a boil. Boil 10 min with hops added. Chill, oxygenate, and pitch yeast. Pitch at lager pitching rates, ferment at room temperature, 5-7 days. Lemon Berliner: At the end of the second boil (the one before you pitch the yeast) add the juice and zest of 3-4 lemons per 23L (5.5 US gallon) batch. Cherry Berliner: Prepare & ferment the beer normally. Once completed, transfer into a carboy on top of 1 kg (2.2 lbs) frozen sour cherries per 23L (5.5 US gallons) beer. Let age an addition month, or until fruit is completely fermented and incorporated, then keg or bottle. I love doing this recipe and adding some brett into the carboy with the cherries. Rye Berliner: Replace the wheat malt partially, or completely, with rye malt. Adds a bright and refreshing crispness. One of the best rye Berliners I’ve made used a 1:0.8:0.2 Pilsner:Rye:Wheat malt mix. Note that the resulting beer doesn’t play as nicely with fruit, syrups, dry hops or fruity bretts as does the regular recipe. Cider-Berliner: Brew the plain Berliner as above; when done mix 50:50 with home brewed cider while bottling/kegging. Do not use back-sweetened cider if a fermentable sugar was used for sweetening. Crisp & dry beer; apple character is subdued. Bretted Berliner: Add fruit-forward Brettanomyces (e.g. B. claussenii) to enhance fruit characters. Funk-forwards bretts add complexity, but this can become overpowering if allowed to develop too much. Fruit-forward bretts work well with citra or galaxy dry hopping (see below). Dry Hopped Berliner: Pretty much what the name says; dry-hop with 14-42g/23L (0.5-1.5oz/5.5 US gallons) of a fruity/citrusy hop. Works well with the lemon and bretted versions described above. Dry hop character seems to be very short lived, so I would recommend doing this with small batches of beer, or a batch of beer expected to be consumed in a few weeks. Dry-hopping in the keg may improve this, but I’ve yet to try it. Session Gose: While this recipe produces a beer weaker than a traditional Gose, the addition of Coriander and salt creates a Gose-like beer that is fantastic and eminently sessionable. I used 1g/L non-iodized sea salt (~0.8oz/5 US gallons), which is middle-of-the-road salt-wise for a Gose, along with 28g of Coriander/23L (~1oz/5.5 US gallon). Whats the differens between 3 (add brett) and 4 (full on sour), and why does nr 3 take 1-3 month and nr 4 takes 6-18 month? The beer is sour in nr 3 as well. 3. Add brett. Adding brett's – especially those with fruity character – and then ageing for an additional 1 to 3 months radically changes these beers – and its a change for the better. The bretts will make a lot of esters – pineapple, apple and cherry being common examples, while some modest funk adds earthiness. The complexity and nuances of these beers is amazing, and well worth the slightly longer wait. 4.Go for a full-on sour. After fermentation transfer to a carboy and add-in a sour mix – Wyeast Roeselare is a good place to start. Or throw in the dregs of your favourite unpasteurized commercial sour beer. Six to ten months later you'll have a much more complex beer with many of the characteristics more typical of sour beers prepared in the traditional (and usually 18 months or longer) manner. Wow…!! It’s very interesting… I am really impressed with your post.. Thanks for sharing it.. The gravity drop will be little (few points) to none, depending on whether the lacto you use is hetero or homofermentative. The drop should be less than 5 points, although I've never sour-worted anything that high in gravity, so it may be more or less. Glad it worked for you. 3.4 overnight is pretty fast – which lacto did you use? Used your Holding Temp Method for A Gose and worked like a charm. pH 3.4 overnight. Held temp fine. Beer in secondary and smellls/tastes great. I've done all-brett berliners and am not a fan – you don't get the normal brett character. In the secondary, after fermenting with a clean ale yeast (american ale, german ale, etc) seems to give the best brett character. Great article! I want to do a sour wort fruited BW and would like to add Brett C. After souring, should I pitch a clean yeast, and then when I rack onto the fruit add in the Brett C? Or, after souring, should I just ferment with Brett C, and then rack onto the fruit? The latter means using less yeast and is less expensive, but I'm going for best flavor, so what do you think? I've used uncrushed grain in the past; I'd recommend making a starter first (see the link to 5 blades brewing in the intro paragraph) as it gives you a chance to "screen" the lacto you get for off flavours prior to putting it into a full batch. Historically I used to just toss some uncrushed grain into the mash tun or kettle to start souring – that worked most of the time, but few times I got some bad bugs off the grain that led to a beer that led to a dumper beer. Bryan, can you provide more information (links) to the heaters/warmers you use to maintain the kettle during souring? I have all the equipment I need to do this except that. Also, have you ever tried uncrushed grains in a muslin bag in the kettle sour as a means of sour worting? This seems like an easy way to do it naturally and they would be easy to remove. Another great article. I am about to start a Gose and this was timely. Thanks. I've not heard of the foam stability thing before – got a link? It would be nice, as head retention is usually poor with BW's. That said, I'm somewhat dubious; this batch took less than 8 hours to drop to a pH of 4.5; I'm not sure how pre-acidifying would do much…unless its inhibiting oxidative yeasts or other bacteria that secrete proteases. Great article – very complete. Only think I might suggest is that the pre-acidification to pH4.5 also supposedly aids foam retention. For fruiting a gose, try fruit that complement the salt and acid. Tropical fruit therefore make good partners. Think coconut, lime, pineapple, mango, kiwi. I suspect Thai basil or mint would be nice too. There is no real good reason to use one temperature range or another with my "system", as my procedures sanitize the wort (and use clean starters), thus eliminating a lot of issues the higher temps are intended to address. At 45-48C you are pushing right up against the maximum temperature range for lactobacillus. When using a grain starter (or just a handful of grain tossed into the mash tun or pot) these higher temps allow the lacto to do its thing, while killing pretty much any contaminating bugs. Because I always boil my wort to sanitize, and use clean cultures (including grain-derived lacto, where I do my starters hot at 45-48C and then confirm its clean before use), I'm less concerned about contamination. As such, I stick with the lower range. This is less stressful for the lacto, and easier for my heating system to maintain. Great article, Bryan! I have read that maintaining a temperature of 45-48°C when using Lactobacillus from grains is recommended (sour mashing). Why do you prefer the 37-42°C range?